Seeking ways to increase efficiency and lower the operating costs of its Dallas-based Tier 3 data center, a Fortune 100 tech company reached out to CLEAResult’s Critical Systems Design Build team for help. The team delivered the entire project cycle, including design, engineering, project and construction management, commissioning and incentive procurement. As all the work had to be performed inside the live data center, extensive planning, precise communication and continued engagement from everyone involved were required to maintain a 100 percent up-time during all phases of the project. At a massive 10 MW, the data center proved to be the perfect candidate for Design Build. After analyzing the cooling system’s energy performance, the team designed a custom retrofit solution that reduced the total annual electric consumption by 8.5 percent. The team installed an RG Loop—a patent-pending waterside economizer developed by CLEAResult to maximize free cooling hours with seamless, automatic operation. To support the RG Loop, a 1,500-ton plate and frame heat exchanger was also installed, and the existing chiller plant systems were re-piped. In addition, the team retrofitted 86 50-ton computer room air handling units (CRAHs) with variable-speed, electronically commutated (EC) plug fans. To precisely monitor and control the data hall cooling equipment, the team installed a combination of hard-wired and wireless rack temperature and under-floor pressure sensors. This reduced fan energy usage by over 80 percent. All told, the Design Build project is projected to save the data center $575,000 in annual energy costs, with an estimated payback of 2.5 years. 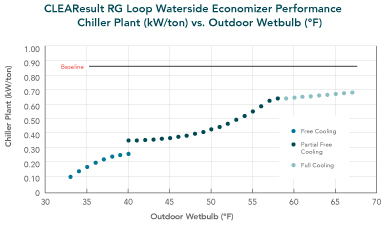 Even in the Texas heat, CLEAResult’s RG Loop saved nearly three times more energy than traditional waterside economizer designs. 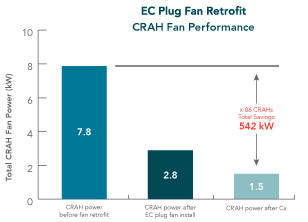 What’s more, the EC plug fan retrofit and commissioning lowered the average energy use of individual CRAHs from 7.8 kW to less than 2 kW.